Having fun with your iPad? It might be time to share your toy with the kids. Check out these apps that make the iPad child’s play. It may take one or two turns for preschoolers to get the hang of 123 Color by Steve Glinberg but once they do, they will be scrolling through the colour palette looking for the perfect shade of green and learning numbers and the alphabet at the same time. Neat sound effects let kids know that they are on the right path and there is the added option of additional languages if you want your three-year-old to be brushing up on their French. The app also includes lots of good old fashioned ‘colouring in’ pages, a world map with ‘pins’ to identify countries and cities, finger painting, twenty-five songs and optional voice-overs (including an Australian voice – yay!). Also with an educational focus is the fun Fish School by Duck Duck Moose. The concept is simple – schools of fish swim around to form numbers, letters and shapes. There is also the alphabet song, a cute colour game and a fishy take on the ‘memory’ game. 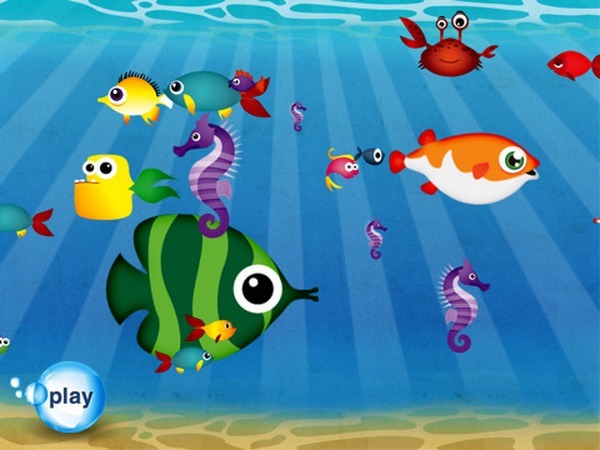 Preschoolers can drive the app or they can just sit back and watch the colourful fish rearranging. I ordinarily steer away from commercial characters simply because there is so much out there and once you start buying, your kids don’t let you stop. However, we do have a soft spot for Buzz, Woody and the Toy Story gang (plus a fridge full of Toy Story yoghurt, a fridge covered in Toy Story magnets, Toy Story games, Toy Story Lego, books, stickers, fake tattoos… you see what I mean!). That said, the Toy Story read-along digital book is pretty swish. 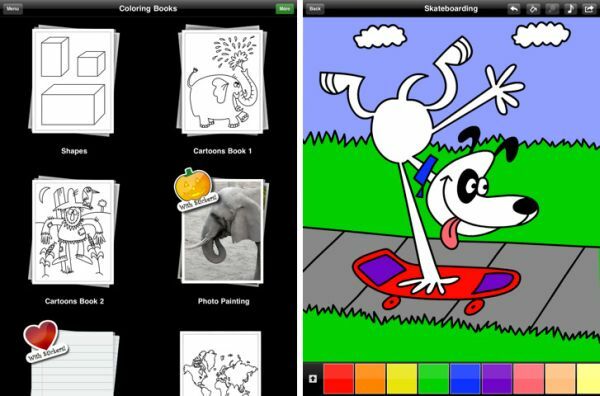 The app includes colouring and music extras but little fans will simply enjoy familiar characters on the iPad. Fruit Ninja is one of those games that I file under ‘Can’t tell you why it’s so much fun, it just is!’ (right there alongside ‘Paper Toss’ and ‘Scoops’). 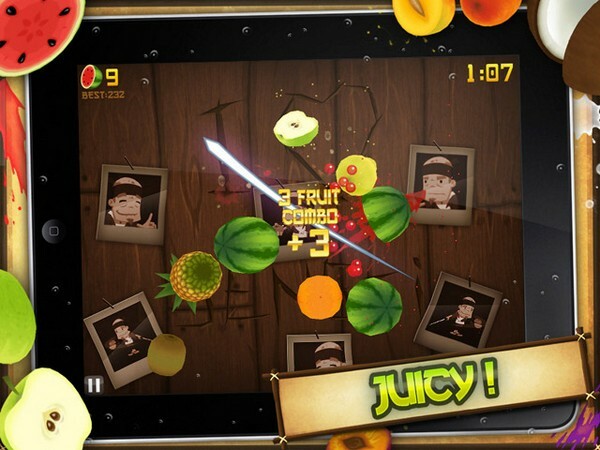 Using your finger as a ‘knife’, the aim of the game is to slice through as much fruit as you can within a certain time. Little kids will enjoy the ‘Zen’ version of the game that will have them chopping watermelons, berries, apples, bananas, kiwis and more at a cracking pace. Older children will like the more competitive version of the game that doesn’t give you any opportunity to miss a piece a fruit. The iPad version of Fruit Ninja lets two people play at the same time. I’ll quote my eight-year-old son for a review of the highly addictive game, Angry Birds – “It’s awesome!” Basically you catapult little red birds to destroy the fortresses of the green pigs. Little fingers will have to be dextrous to get the bird aiming at the correct angle but like all of these games, kids pick it up very quickly. As you play, you unlock different levels of the game. My favourite bits are the sound effects – those birds really are cranky. Lastly, calm things down after angry birds and frenetic fruit chopping with the sublime Koi Pond. It’s not a game and is not designed specifically for children but kids will find watching fish swim through the amazingly real water strangely calming. More portable than those executive toys of the nineties where you pushed sand around a wooden box with a miniature rake but equally as mesmerising, Koi Pond has lots of options to customise your pond. I especially like the ambient nature sounds that you can add a sleep timer to. 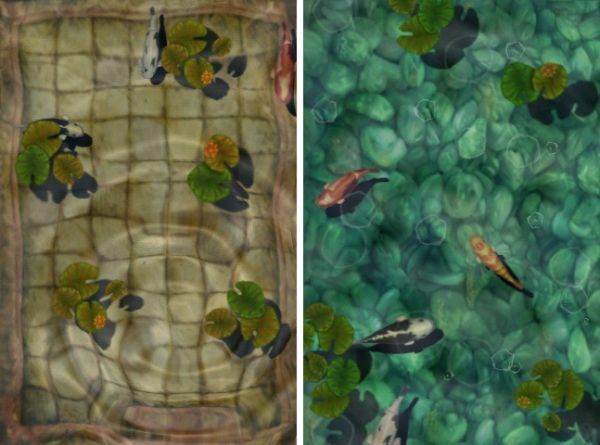 Designed specifically in high definition for the iPad, the pond is stunningly realistic. Still want more? Check out some of the apps for the iPad featured previously on Babyology.